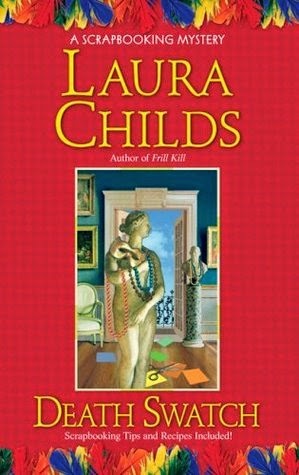 A scrapbooking mystery by Laura Childs is my latest find. I have enjoyed several of the mystery novels in the series and am getting some ideas for showing family photos from the book, Death Swatch (Sept. 2008) I'm also finding out a lot about New Orleans culture and couture, past and present, about the pirate Jean Lafitte and buried treasure near New Orleans (fictional and legendary), Mardi Gras parties, and of course ways to spend time and money making your memories with scrapbooks and "memory" books. Don't look for realism - just plain New Orleans fun mixed in with murder and mayhem. In Death Swatch, the main character witnesses the death of a party goer and is not at all traumatized. She goes about her sleuthing, her scrapbooking, and party going with so much aplomb. Of course, this is meant to be a "cozy" mystery and meant to be read just for fun. 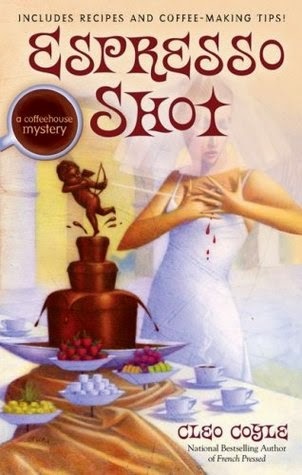 Espresso Shot by Cleo Coyle, seventh in the series, published September 30, 2008. Set in Greenwich village, NYC. Clare Cosi and her ex-husband Matt jointly run an upscale coffeeshop in Manhattan. Matt's about to remarry and begs Clare to stay close to his fiancee, who might be in danger from unknown persons. Clare herself is involved with a policeman, Mike, so she doesn't mind that much though it keeps her from managing her coffeeshop. Lots of coffee talk in this novel. Mochaccino - espresso with chocolate syrup, steamed milk, foam, topped with whipped cream. Doppio expresso - double shot of espresso. Hazelnut-toffee latte with foam. Macchiato - espresso dotted with a spoonful of foamed milk. Don't think I've heard of those much. I'm not a classical music aficionado but can say I am now a big fan of Beethoven's Symphony No. 8 in F Major, Op. 93. Having never heard this symphony before, I didn't know what to expect at a concert I attended last night, but the guest conductor Scott Yoo brought the music to life with his lively movements. Watching him conduct definitely helped me understand and appreciate the music. The 8th symphony is described as one with "rough, boisterous humor," with no slow movements. And so it was, delightful in the way it carried the musical theme, bouncing it around like a ball, from one section of the orchestra to the other, and then expanding it to the entire orchestra. Mozart's Brandenburg Concerto 9 No. 4 in G Major I enjoyed immensely as well, but in a different way. It was so soothing that it lulled me to sleep. I can recommend it to anyone who needs music for relaxation, and even as a lullaby. It may be however, that the pianist played somewhat hesitantly and not with the kind of vigor that might have kept me from being totally relaxed.